There are plenty of things to do in Astana but many people don't even know it exists. 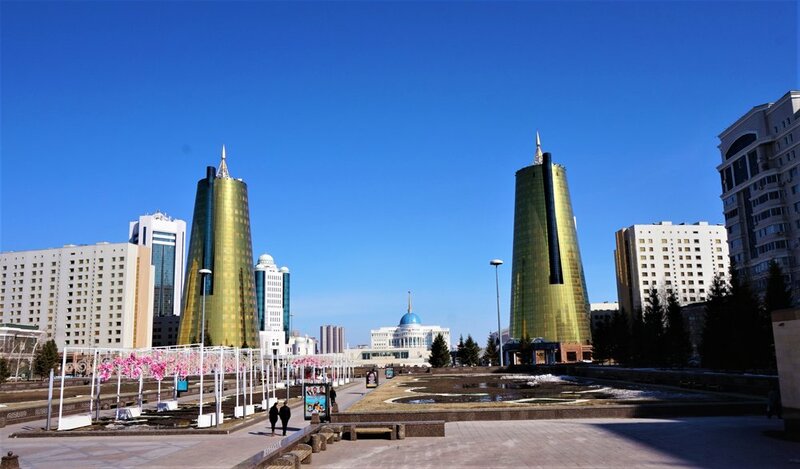 If you're travelling to Kazakhstan chance are you will be visiting Almaty but the new capital city is definitely an interesting stop to add to your visit to this huge country! Astana is the newest capital city in the world. What was previously a little known city in the North of Kazakhstan has been built up into an ultra modern home of the elite. Over the last 20 years the city has been filled with impressive architecture and huge apartment blocks to become an up and coming world capital. The city itself feels huge but with a population of just 800,000 it is still in beginning phases of its young life. We were there a few months before the World Expo for 'Renewable Energy' which will be Astana's first major appearance on the world stage. Evidence of Expo advertising and preparations were visible on every corner and many buildings were being repaired or constructed. 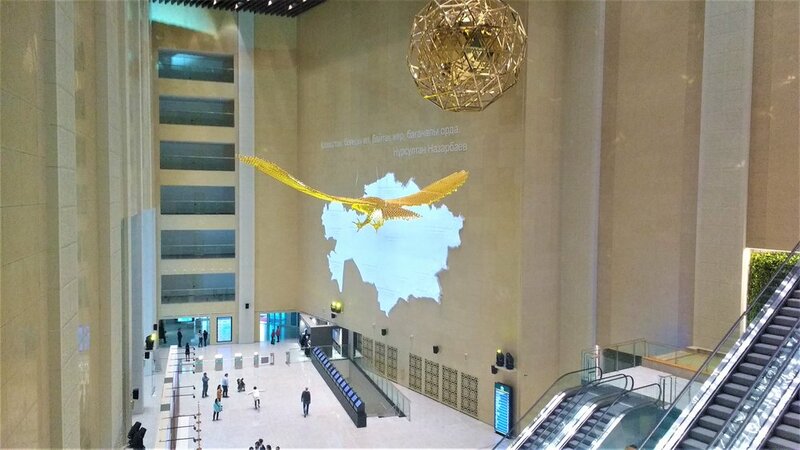 Astana left us feeling a little culturally confused due to the influence from Kazakhstan's many neighbours. The inner city was reminscent of Dubai and Islam is the predominant religion. But there was definitely a strong Soviet feeling with the cyrillic signs and Russians making up about a quarter of the population . The culture and cuisine around also has a distinctly Asian flavour. We spent four days in Astana and really enjoyed exploring the city and getting to know Kazakh culture and food. If you're planning a trip to this part of the world or you just want to know what we got up to (Hi Mum!) here's our top things to do in Astana. Get Around: Uber is cheap and very easy but you need wifi. Walking distances are long. We stayed at HOSTEL Astana. This place was located a little out of the city centre but Uber rides or taxis are very cheap. Comfortable and affordable accommodation and just look at those views! If you’re looking for something more social try Hostel Forum which has comfy and cosy dorms and a large family room. Click here to book. Apartment stays are very popular in Kazakhstan so you could also check Airbnb. Get €25 off your first stay by signing up here! This area is the centre of the new Astana stretching from the Presidential Palace to the Khan-Shatyr Entertainment Centre. Walking along this 3.5km pedestrian area is on of the top things to do in Astana and will leave you feeling awestruck by the size and grandeur of some of the buildings. We were there right at the start of spring but a few weeks later and the area would have been blooming with neatly planted gardens and blossoming trees. Astana has some of the most impressive architecture I’ve ever seen in a city. Everything huge and some kind of feat of engineering. From the largest mosque in central Asia to a glass pyramid and the world’s largest tent. Some notable buildings to walk by are the Monument of Peace and Reconciliation, The Astana Opera House, the Velodrome and Astana Arena. Many of the buildings in Astana are also eco-friendly and use a range of modern technologies to be energy-efficient. In the middle of the new town stands Astana’s icon. A 97m high tower featuring a golden sphere at the top. This is the top attraction in Astana and is a local icon. Usually tourists can take a lift to stand inside the sphere and view Astana from above. Unfortunately it was closed for construction in preparation for the Expo while we were there but the views would be stunning. As I mentioned, Astana is home to the world’s largest tent and it’s really amazing. The tallest point is 150m high and the area underneath is the size of 10 football pitches. The transparent ‘tent’ keeps the interior at a consistent temperature throughout the year. Inside is a shopping mall, food court, mini theme park including a monorail and a beach club complete with sand and palm trees! There are a good range of affordable restaurants inside and it’s definitely worth seeing. This is an interesting museum if, like us, you knew very little about Kazakhstan before you decided to go there. It's only 500KZT entrance (around €1.50) and you can easily spend a couple of hours wandering around. Highlights for us were the real yurt, the sound and light show in the entrance hall and the 'making of Astana' exhibit which includes miniatures of all the major buildings. It was hard to gather the schedule for these 'shows' but they both played twice in the time we were there. We paid an extra 1000KZT to visit the 'Hall of Gold' because we were so enthralled by the name. It wasn't really worth it when you consider it's twice the price of the rest of the museum. But it doesn't break the bank so if you're not on a budget check it out. Kazakhstan provided some of the best coffee I've had in a while. Astana is home to many hip coffee shops but you have to look carefully. Lots of cafes look rundown and closed from the outside but contain comfortable, quirky interiors with amazing coffee! Our favourites were Traveler's Coffee and Hot Spot Coffee. Don't listen to your mother, make sure to go out after dark. We had amazing views of the city from our hostel room but it was more impressive to wander the central city and see it up close. 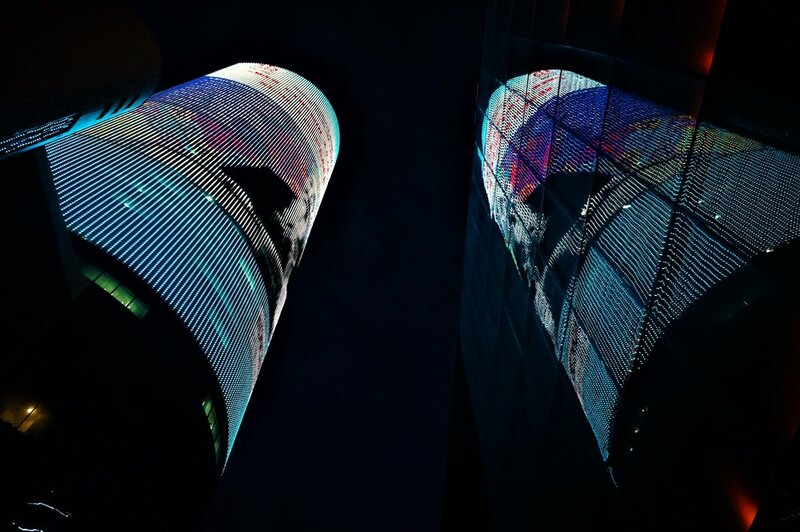 From a 50 storey screen to the colour changing buildings it was a real spectacle to see. We found Astana to be completely safe at night.